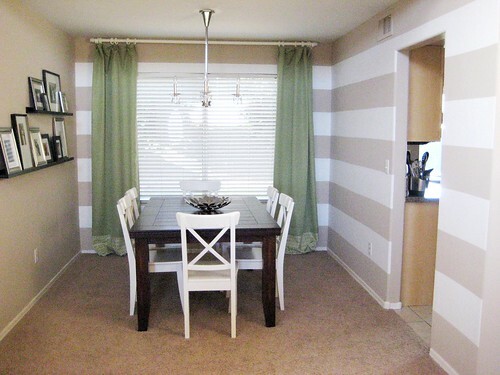 I got a wild hair on Saturday afternoon and decided to paint stripes in my dining room. Here's how the room looked before we moved in. And here it is in its striped glory. 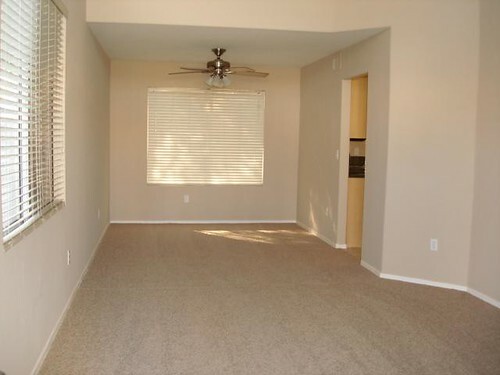 There are still a few things I'd like to do in here, like probably get a big art piece for the striped wall that doesn't have the window, and a big rug to bring in some more color. But I am liking the progress so far. I used this tutorial from Young House Love. I also tried FrogTape for the first time, and I am a believer. My wall is textured so I was worried about paint leaking through the tape, but the FrogTape worked like a charm. i like! i also really like your floating shelves. i'm too afraid to make a collage of my family pictures so they're just in a jumble on a dresser. 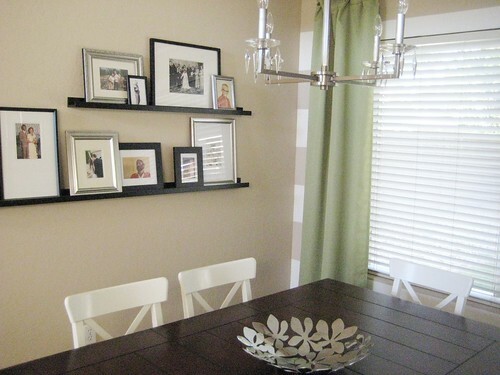 a floating shelf looks really nice with the pictures on it. i need to get on that. Cool transformation! I love how bold it looks. Where did you get your chandelier? I love it. If it's not too much to ask, would you mind doing a post on light fixtures? I am having a hard time finding anything I like. Oh my gosh I LOVE it!! And I'm so jealous that you can think of something on Saturday and just do it:( It looks amazing! That turned out amazing! 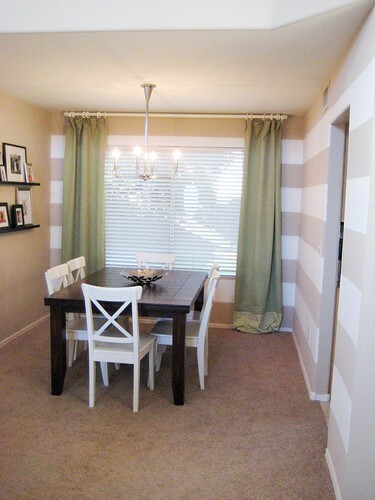 I wish I would have known about that tape when I painted all those stripes in Jackson's room, it took forever! Love the new stripes! I love how it turned out! Great job. Stripes are my favorite! Very cute, I love your table! Where did you get it? Nice job! The white stripes bring out your white chairs..love it. I am jealous of your stripes. I had some wild hairs for about a month, but now they are all gone. How can I get them back? Just kidding. Job very well done. 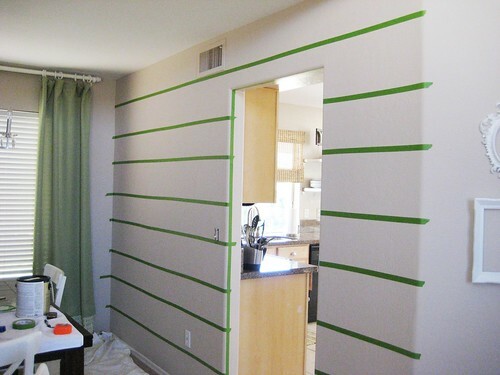 Your stripes look professional--I have never heard of frog tape, if it makes painting textured walls easier, I'm buying it. The stripes look fantastic! Where did you get your dining table from? I Love it!